When a hedge becomes a risk: The recent rally in corn prices. Commodities markets have been quite agitated in May. The tremors felt on May 5 have not dissipated and recent data on the US economy, the risks of inflation in China’s and the protracted debt crisis in the EU left many traders wary. Prices of precious metals, industrial metals and oil have all dropped. So far, grains, led by corn, have held their value pretty well. Corn is now being planted to be harvested in August. Weather is the main factor affecting the progress of planting and yields (#bushels per acre), and consequently a key driver of prices for new corn. Estimates indicate that the planting season is behind schedule, and that flooding of the Mississippi has destroyed some fields. Lower expected yields and acreage put further strains on an already historically tight ratio of stocks-to-usage – a measure of supply and demand. Presumably these facts should have a greater impact on the incoming crop season (new corn). Yet, the recent sharp rally in corn prices occurred in nearby contracts (July futures) rather than in December futures contracts. Why is old corn more bullish than new corn? 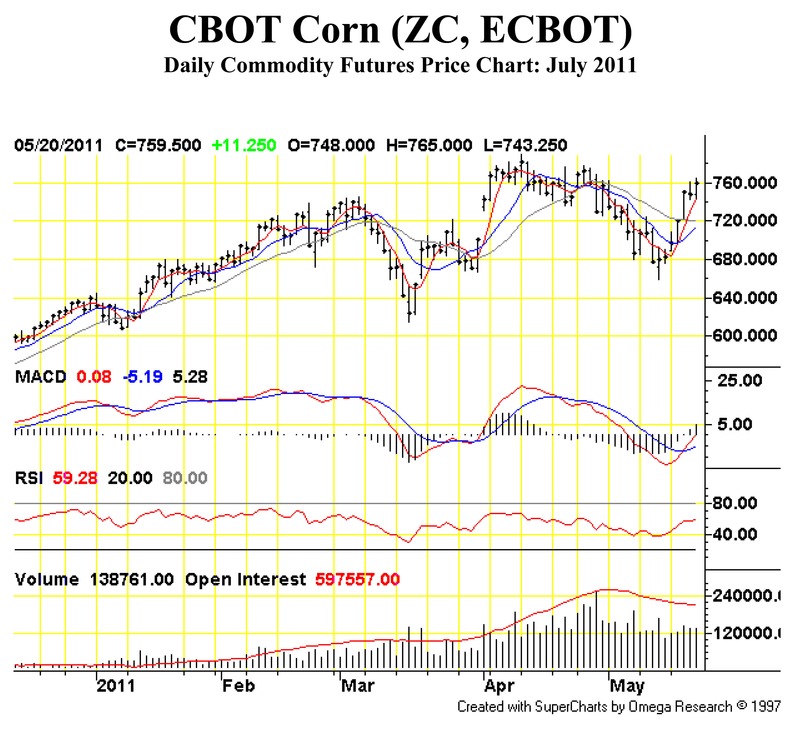 On Thursday, May 5, commodities markets fell sharply. On that day alone, the DJ-UBS index of commodities prices lost 4.7 per cent. The rout is said to have started in the market for silver, but rapidly spread to a wide range of commodities. Silver is used for commercial purposes. Recently, however, the metal has been trading predominantly as a speculative asset. A lot of people now associate silver with the role traditionally given to gold as a store of value against the erosion of fiat money. As such, the price of silver, instead of reflecting the value of the stream of income derived from the traditional commercial uses, is driven by changing beliefs about grand macroeconomic events. This is how silver has gone up by more than 70 per cent in just three months, between the end of January and April 29. Silver prices halted their rapid ascent with an abrupt fall of 28 per cent in the first week of May. Fundamentals can hardly explain such a violent reversal. Searching for an answer, many pointed their fingers at the Exchange, which raised margin requirements on futures positions four times for a total increase of 61 per cent since April 25. Three increases happened in just five trading days. The argument goes like this: many investors, surprised by the repeated large margin increases were unable to quickly arrange financing of the margin and were forced to sell their positions, driving the price down. This selloff may have been aggravated as other investors panicked. Some complain that the Exchange was deliberately, and unfairly, trying to push prices down. Others use the occasion to press the political case in favor of more aggressive use of margin requirements as well as position limits to stop speculators from inflating the price in the first place. In September 2008, Constellation Energy, a major electric utility in the US, was on the verge of bankruptcy—see my analysis here. That rang alarm bells throughout the territory covered by the PJM Interconnection, one of the largest electric power marketplaces in the world, stretching from New Jersey, Pennsylvania and Maryland in the east to Illinois in the west. Because of Constellation’s many transactions in the PJM market, a default by Constellation could have saddled PJM with an unpaid bill of more than $100 million. No one knew what might have happened next, especially since this incident was happening just as the global financial crisis was threatening the economy everywhere. Would liquidity in the electricity market dry up? Would buyers and sellers come forward with bids for the coming days transactions? Would the PJM market itself survive? If the market was in jeopardy, how would the supply and demand of electricity in this vast region be matched? Who would dispatch the many generators, and with what authority? How would prices be set? The chaos that followed the collapse of the California Power Exchange in 2000 provided one somber scenario, despite the fact that there was a much longer advanced warning for that collapse. Fortunately, Constellation did not go bankrupt and we’ll never know exactly what the consequences would have been. Fortunately, too, that didn’t stop the Federal Energy Regulatory Commission (FERC) from taking notice of this close call and identifying necessary changes in the credit system to minimize the chance of a similar event wreaking havoc on the electricity system in the future.